Anyone in a prominent marketing role knows that periodically, it’s important to go through the process of changing and/or refining company messaging or positioning. Positioning in business is related to how we describe ourselves to the world. Today, I have examined a recent positioning change by Accenture. Consider Accenture’s online positioning changes when you go through this exercise and make sure your social media presence doesn’t get left behind. As a bonus, if you happen to compete with Accenture, this is a competitive heads up to a subtle shift they’ve made. If you work for Accenture, I’ll make few suggestions on how to finish the process you’ve started. Accenture is a company I track in my Interbrand 100 market landscape that I keep in Rival IQ (my firm). I noticed that on April 1st, they made a number of coordinated changes to their homepage and to their meta-tags. Did Social Media Get Left Behind? 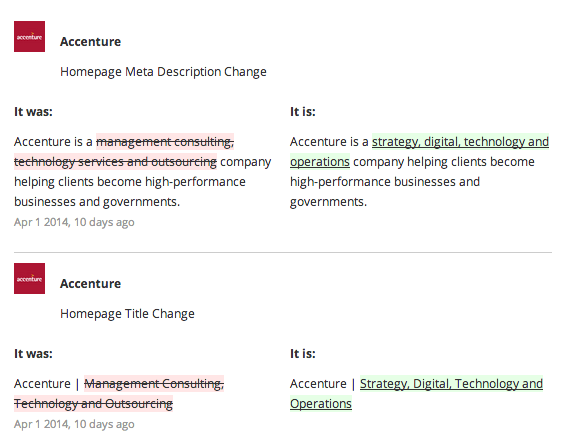 So far, Accenture has done a flawless job at making their new positioning consistent across their web presence. I’ll leave the discussion on the value and what these changes mean to Accenture and their competitors in this market. Where I do have an opinion is about what got left behind and what we can learn from this. Positioning work is challenging. I’ve worked on it myself and have felt the pain in changing company positions. Given that experience, however, I’m very impressed with the consistency that Accenture has shown historically across a multitude of channels.I’m actually quite surprise that as of April 11th, they haven’t updated their social profiles with their latest positioning. Why not? Take this example to remind yourself to look at your current positioning across the many places your marketing messaging shows up. Are you being consistent? Will Accenture finish the high quality job they started? How does your positioning compare across your various social and web channels? Tell me your experiences. Have you seen this kind of discrepancy before? I would love to hear from you.